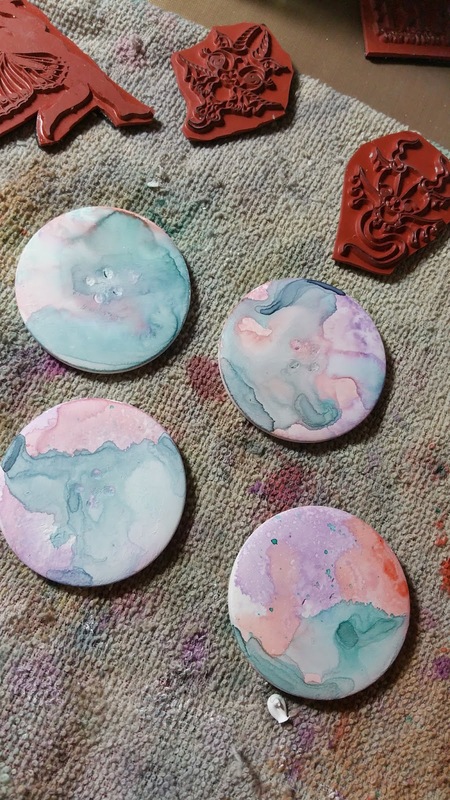 Blank Page Muse: Create Flair with your Sin City Stamps! Hi, Sin City Fans! I am up today on the blog to show you how you can create some adorable flair embellishments using your Sin City Stamps and a few products! 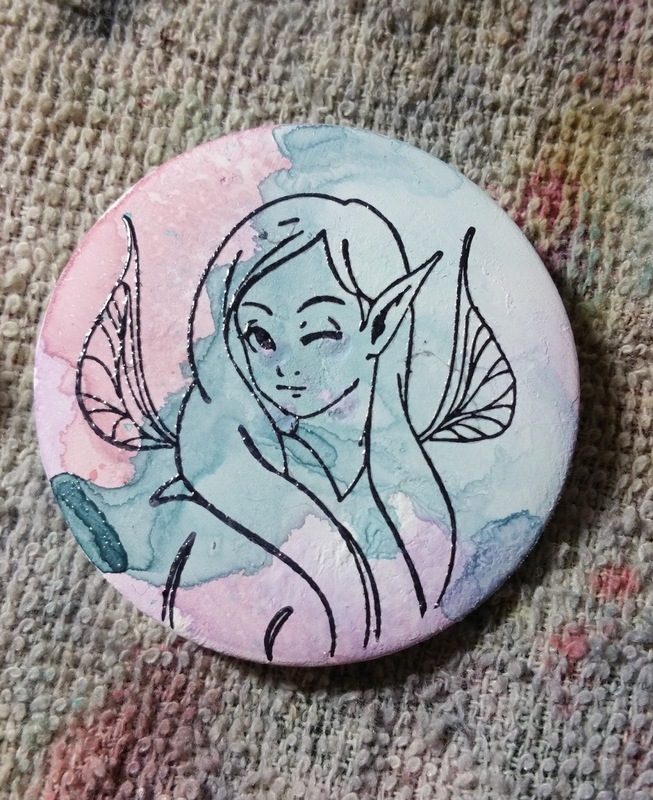 For those of you that are not familiar with flair, they are usually buttons that can purchase to place as an embellishment on your mixed media and paper crafting projects. In this tutorial, I will show you how you can make some of your own unique ones!! Anime Fairies & Baby Dragons Fantasy Art Rubber Stamp Sheet Set here. Fairies & Blossoms 2 Rubber Stamp Set here. Love Of Butterflies Rubber Stamp Set here. They are available individually as well in the online store. Start out with large buttons. These are approximate 2X2 inches. 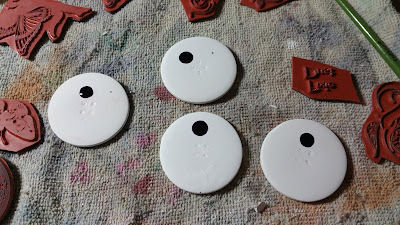 Using a small palette knife fill holes with modeling paste. Let dry and sand off any bumps left. Paint a layer of white gesso and dry. Drip ink (I used Art Anthology Minx Ink here) on buttons and spray with water lightly. Move color around to spread and create a "watercolor effect" Continue with a couple more colors drying in between. Your buttons will look similar to the ones pictured above. Next, choose the stamps you would like as images and make sure they fit how you like. Use black archival ink to stamp to button. While ink is wet cover with clear embossing powder and shake off excess. 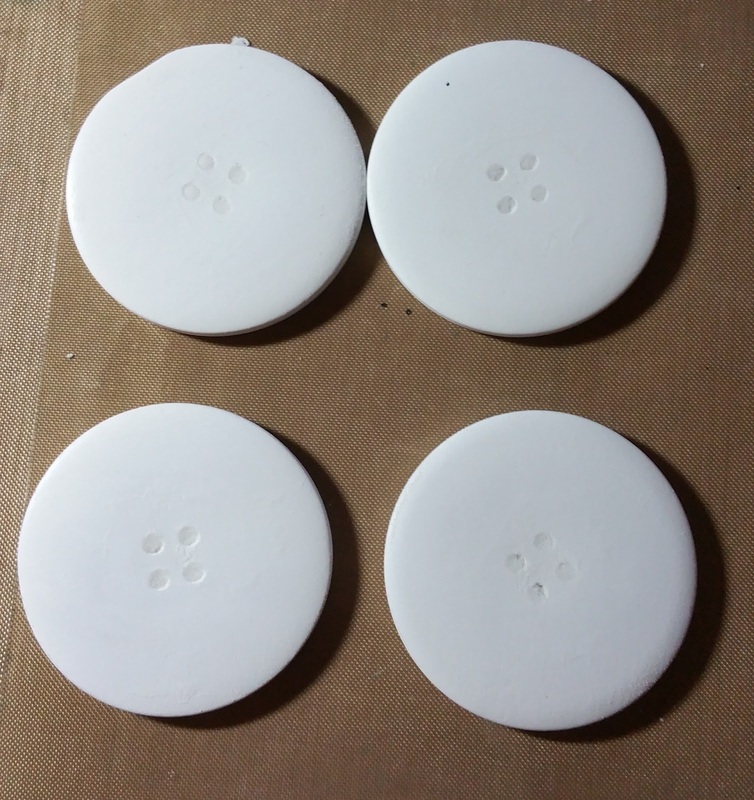 Activate embossing powder slowly with heat tool. For the next step you can choose to either keep the plain image as pictured above or choose to fill in image with color as pictured below. 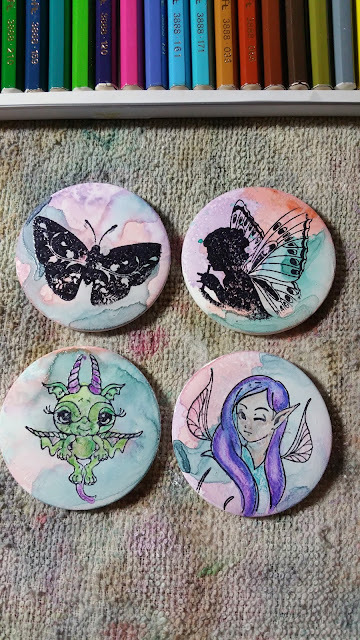 For these I used watercolor pencils and water-brushes to color my images of dragon baby and pixie. In the end I wanted even more color so I let dry and then added several hues of distress inks to mine. Once ink was dry I coated with decoupage glue and sealer. I hope you have enjoyed this tutorial and that I have inspired you to get creative and make some flair of your own!! Remember to follow us on our Facebook Fan Page here and share what you create! I will be back soon for more projects to inspire you!